Körperliches Training hat sich als Behandlungsoption der chronisch stabilen Herzinsuffizienz in den aktuellen Leitlinien etabliert. Grundlage hierfür bilden mehrere Studien und Metaanalysen, die eine Verbesserung der Lebensqualität und der körperlichen Belastbarkeit durch ein Training belegen. Zudem zeigt sich auch eine geringere kardiovaskuläre Hospitalisierungsrate. Vor Beginn eines Trainings muss eine umfangreiche Voruntersuchung erfolgen. Bestehen keine Kontraindikationen sollte das Training nach evaluierten Konzepten und unter Aufsicht begonnen werden. 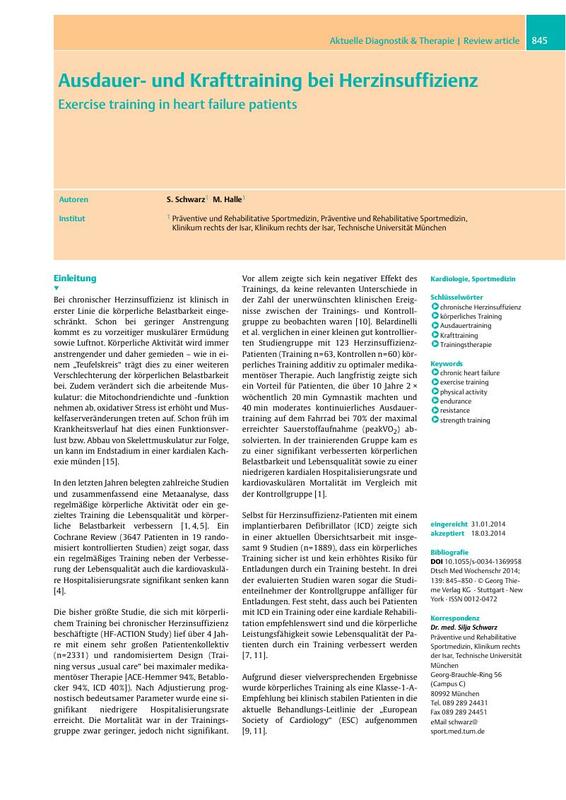 Als wirksam haben sich dabei ein kontinuierliches Ausdauertraining und in neueren Studien auch ein Ausdauertraining nach Intervallmethode erwiesen, welche optimalerweise durch ein Muskelaufbautraining ergänzt werden sollten. Physical exercise has been recognized as a standard therapy in the guidelines for secondary prevention of chronic heart failure. This is mostly due to the overwhelming scientific evidence, including meta-analyses that have illustrated the positive effect of physical exercise on quality of life, hospitalisation and exercise capacity. However, it is crucial that patients undergo thorough clinical screening, including exercise testing, before starting an exercise regimen. Once a patient is eligible to exercise, it is also important that only approved exercise regimens are prescribed and that the exercise itself is monitored appropriately. Both, traditional moderate continuous endurance training and recently developed interval training have been shown to be safe and effective in chronic heart failure. Ideally, moderate intensity training should be started and later combined with interval training that is added by moderate resistance training in order to improve quality of life and prognosis.